This is a special holiday edition of Dorkbot SoCal, held at perhaps the most ambitious light display in Southern California. We'll meet at the driveway of Ric Turner at 7pm on Tuesday December 28th 2010, and he'll demo and explain his latest Christmas Light video game project, Snowball Blaster. Ric Turner is a former Disney Imagineer who created special effects for theme park attractions and shows such as Space Mountain, The Haunted Mansion, and the Finding Nemo Submarine Voyage. Hop in Santa's electric training sled and grab the game controller for an adventure in snowball dodging. Press the left button to move left and the right to move right. Make it past all the snowballs for a big light show! (nobody has made it yet!) Game is easy enough for kids and challenging for adults... and quite addictive. Come on out, and bring your friends and family! This is the support page for the AtCrashSpace app. This app allows you to see if the Crash Space hackerspace in Los Angeles is open. If you are connected to a network inside Crash Space, you can also "check in" to indicate your presence. ...seems like I've got some good breeze now with the 56mm ducted fan. Be careful, these ducted fans will slice your finger off! Set up: Great Planes Ammo 20-40-3500 In-Runner Brushless Motor, Great Planes Silver Series 25A Brushless ESC, Great Planes HyperFlow 370 56mm Ducted Fan Unit, 9V/17A power supply from MPJA, and Arduino. Below is the sketch that works with the Great Planes ESC (adapted from other people's ESC sketches). It arms the ESC, then sweeps the speed up, stop, back to full speed, and sweeps back down to off. I hooked up a Great Planes Ammo 20-40-3500 In-Runner Brushless Motor attached to Great Planes Silver Series 25A Brushless ESC 5V/2A BEC powered by Radio Shack 7.2V battery and controlled by Arduino servo library. I believe the prescalar leads to 16 MHz / 8 = 2 MHz, then I count up to 500 meaning about 4 kHz frequency output, then I move it up to a 70 count or 28.5 kHz. When you are starting a new tech art project, you are engaging in a search for the best way to implement your idea. As soon as you make a large purchase, you immediately will find an even better solution! I've had lots of fun with the servomotors, but now I am wondering about ducted fans and from the R/C hobby world for breath-over-IP, it sure would be a BLAST! They appear to have electronic speed control, but I wonder how fast they can speed up/slow down. Also I'd need a 34A @ 11V power supply, not hard for a big battery, but tougher for a 120V based system. These R/C electric airplane motors are much faster than industrial servomotors (8-20 kRPM versus 3-4 kRPM), so I suspect their props are probably more efficient (more lift, less drag). Apparently you can get the motor and esc together or a ducted fan motor/prop/esc together well. But you better put some mesh on it or you will slice off someone's finger! Finally, the affordable (~$100) Linux SBC with Ethernet is here. Very interesting, and great competition to the Mini2440 board, which is $89 with Ethernet, with the same amount of RAM and 128MB of flash RAM on board (can be as big as 1GB for more money). The Mini2440 doesn't have the NTSC/PAL video, accelerometer, or battery charger. I am having some trouble getting DHCP to work on the Mini2440 with the base Linux/Qtopia load (based on Busybox, it evidently uses udhcpc which requires me to write a not-well-documented script). Not much time to play with it the SheevaPlug yet. 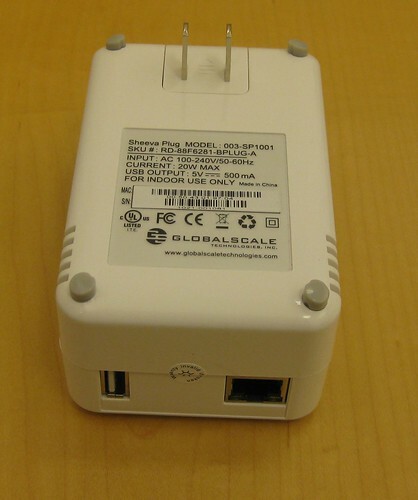 I am intending to use it for an Ethernet-to-serial application (using a USB-to-serial converter). The GPIO lines are pretty much hidden in the SheevaPlug, whereas the Mini2440 and Chumby Board have them easily available. On the other hand, SheevaPlug ships with Python, so development on it is a breeze! As you hook up the Geckodrive 320X, follow the instructions step by step, and don't forget to hook Terminal 5 (ERR/RES) to Terminal 7 (Encoder +5VDC), or else the controller won't work. Also for the Tohoko Ricoh Type 7K00011 Servo Motor, you should set switch SW6 (HEDS) to "ON" to provide an active pullup for the encoder. And the 320X didn't even get very warm - great heat engineering! The Geckodrive is a highly precise device. You drive it with pulses. Each pulse means the motor is to move ahead on pulse on the encoder. Of course, motors can just speed up and slow down infinitely fast, so if you change the input pulse rate, there is a brief period of error where the Geckodrive applies a higher duty cycle PWM to the motor to catch up. However if the error is too much (configurable by DIP switches on the Geckodrive), the controller assumes there is a fault, stops for a second, accepts the new position as "good" and starts again. At the end of the video above, I am probably trying to drive the motor faster than it can actually go, thus the controller faults out. Also you can't just start the motor at its highest speed. You might have to start it at a slightly lower pulse rate and ramp it up to a higher speed, or else the controller might fault out. I am going to experiment with increasing the 256 count following error limit to the 2048 count following error limit and see how that changes the ability to do a cold start to a high speed. Also I may try a sneaky thing where I hook up the encoder from a second motor to an Arduino, read the quadrature input to generate a pulse and direction signal, and send that into the Geckodrive to see if my twisting of the rotor on the undriven motor is reflected in the driven motor. I think the Geckodrive and Tohoko Ricoh Type 7K00011 Servo Motor may work not only for "Breath 2 - the proportional version" but also for Ouija board over IP. I have to put a fan on the motor and see if I get a good breeze from it. This page is for support of the Breath OSC Interface iPhone App. Please feel free to ask any questions or provide bug reports below. Meetings are free and open to the public. Parking is free. Carlyn Maw, a co-founder of CrashSpace, a Los Angeles Hackerspace, formerly an instructor and graduate of NYU ITP, presents an introduction to Physical Computing. · A musician composing a symphonies based on data collected from sensors on the body. · An occupational therapist working to develop a pressure vest for children with sensory modulation disorders. · A scientist tracking monkeys. · A fashion designer creating a dress that unfurls like a flower. Additionally, Physical Computing has become a way of life for the communities forming around it. People around the world are working to increase the accessibility of the making things way of life. Carlyn will provide an overview of the conceptual approaches, tools, people and communities that are contributing to Physical Computing today. slides/15 seconds per slide to give a lightning presentation. live band karaoke hosted by Cedric Yarbrough of Reno 911. "ATLAS in silico" is the result of a vibrant collaboration between artists and scientists spanning new media, computer science, metagenomics, biology, and engineering. Ruth West is an artist with background as a molecular genetics researcher. She is Director, Interactive Technologies for CENS (Center for Embedded Networked Sensing) on the UCLA campus and is concurrently an Artist-Research Associate at the UCSD Center for Research in Computing and the Arts, where she is the first CALIT2 New Media Artist crossing over to the Digitally Enabled Genomic Medicine Layer. Todd Margolis is currently the Technical Director of the Center for Research in Computing and the Arts (CRCA) at UCSD. In 2004, he received his MFA in Electronic Visualization from the Electronic Visualization Laboratory at the University of Illinois at Chicago. He is a founding member of the immersive and interactive art and technology non-profit organization, Applied Interactives, and also a member of the art collaborative Sine::apsis Experiments. Joachim Gossmann is an audiocentric media artist interested in a true interdisciplinary discourse between science and the senses. He is currently working on a PhD in Computer Music at the Center for Research and Computing in the Arts at U. C. San Diego. He also holds a a Tonmeister degree from University of the Arts, Berlin, a MFA in Composition/Experimental Sound Practices from the Californian Institute of the Arts, and has 6 years of professional experience in research, production and development of music in experimental media working at Fraunhofer IMK and the Center for Arts and Media Technology in Karlsruhe, Germany. Dane holds an MFA from CALARTS, and creates electronic sculptural works that blur the line between organic and inorganic. MLuM is a Long Beach and Singapore based punceptual histriophonic art ensemble, comprised of multi-national artists whose creato-researchive interests include: The utilization and/or incorporation of scientific, scientistic and pseudo-scientific technologies, methodologies, idealogies and procedures in(to) aesthetic and artistic processes and practices; The aesthetics of sustainability; Sustainability as artistic tradition and genre; The geographics of social networking pertaining to the environmentics of location and mindset; Performance orientations relative to interactive systems within improvisational structures and environments; Charting influence within the aesthetic-ismos. Always in search of collaborators, MLuM will deliver a paper (presented at MUSICACOUSTICA, Beijing) entitled "Databasethetics." This is the code for breath-over-IP for an Arduino. This code uses the NewSoftSerial library, and assumes the use of a Lantronix Xport / Xport Direct (perhaps with a LadyAda Ethernet Shield).